This store bought costume for kids entered our 2015 Halloween Costume Contest. Piper is 4 1/2 and was introduced to shear by her father a few months back and she loved her because she was a powerful princess! 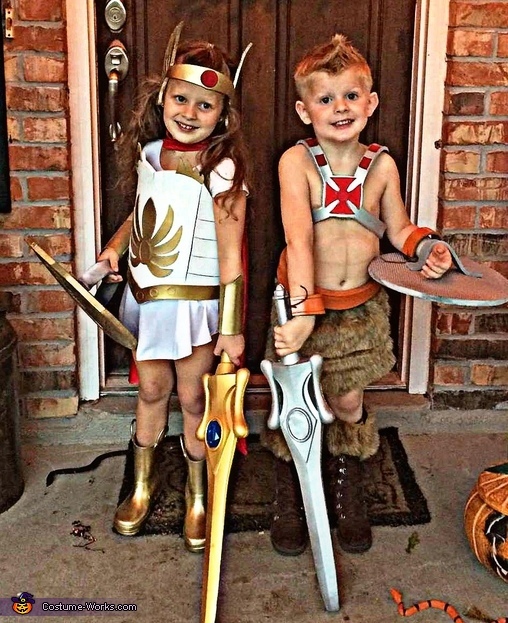 So we convinced her three year old brother Gage to be he-man. Do you have a pattern you'd be willing to share? My son LOVES He-Man thanks to Netflix but I cannot find a costume anywhere and the only swords that actually look like yours are $100 . Where can you buy the swords? We hand made both outfits and I don't remember where he got the swords.... some online store! Hi how can I buy 2 off the human outfits for my 5 year old twins please?